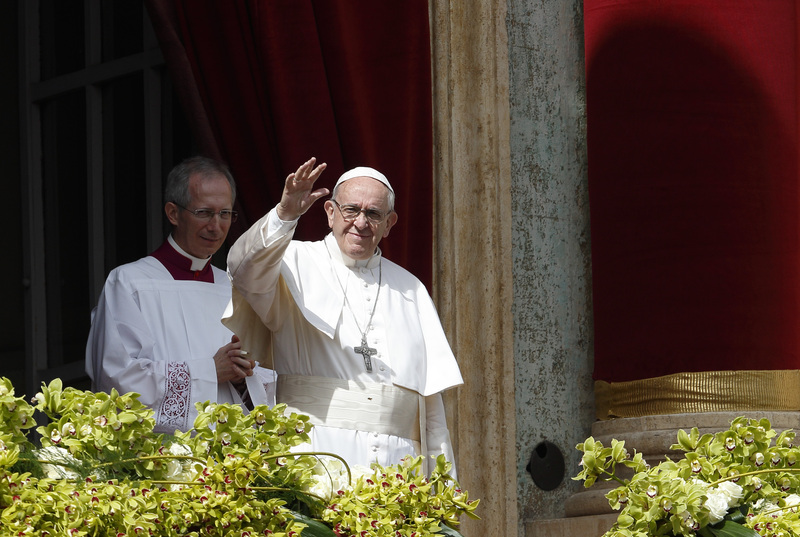 In his Easter message, Pope Francis reminded people throughout the world that “Christ’s resurrection is the true hope of the world” and appealed for peace and an end to “the carnage” of the seven-year war in Syria and for reconciliation in the Holy Land, which continues to suffer from a seven-decades long war. He also prayed to the Risen Christ for “a just, peaceful and humane” solution “to the political and humanitarian crises” in Venezuela, and he asked the Risen Lord to bless the efforts aimed at bringing peace to the Korean peninsula. Francis delivered his sixth Easter message as bishop of Rome and leader of the world’s 1.3 billion Catholics from the central balcony of St Peter’s to the tens of thousands of pilgrims from all continents that had earlier attended his Mass in St Peter’s Square, and to the inhabitants of the the city of Rome (“urbi) and the world (“orbi”). Next, he prayed for “reconciliation for the Holy Land,” which, he said, “is experiencing in these days the wounds of ongoing conflict” between Israeli’s and Palestinians “that do not spare the defenseless.” This seemed to be a reference to the killing of some 16 people and the injuring of many hundreds in recent days on the border between Gaza and Israel. He also prayed that the Risen Christ would bring peace to the Yemen and other places in the Middle East. He prayed especially for peace “in South Sudan and the strife-torn Democratic Republic of the Congo” and especially for the children who suffer from those conflicts.